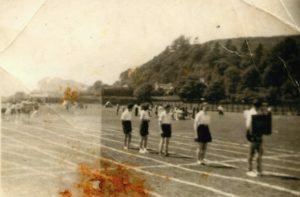 Black & white photograph of the Tiree team competing at the County Youth Sports competition in Oban around 1950. L-R: unidentified boy, Margaret Sinclair of Balephuil, John Galt, Dolina MacKinnon and John MacLeod. Local news: Youth Club prize-giving; interview with Tish MacKinnon, Kilmoluaig; Tales from the Stackyard – fatal boat wreck 1828; Feis Thiriodh 2008; RSPB information. Newsletter `An Tirisdeach`, No. 412, 15/3/2008. Local news and events including planning permission for the wind turbine, an interview with Nancy MacKechnie, a youth club drama workshop and SWRI meeting.